I love tireless photo archives of the seemingly mundane objects we run into every day. 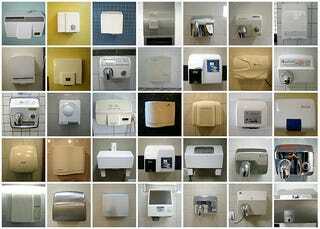 To wit: this study of 96 bathroom air blowers from around the world by photographer Douglas Wilson. Even though that guy from Dyson is right re: these things never, ever drying your hands sufficiently, it's fascinating to see the variety of designs. (Looks like Wilson has yet to run across an AirBlade in his travels).